Preparing high school students with disabilities for college, careers, and leadership. 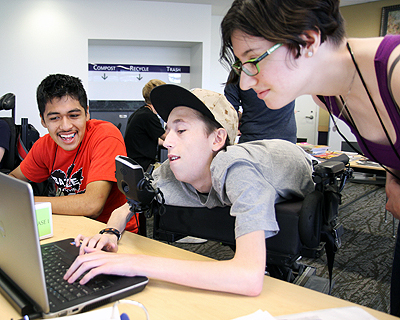 DO-IT Scholars prepares Washington State high school students with disabilities for success in college and careers. Scholars attend Summer Study sessions, held during three consecutive summers at the University of Washington campus. This allows students to experience college life and work on self advocacy skills. Throughout the school year, Scholars connect with program staff, DO-IT Mentors, and each other using email and e-lists. They also meet in-person at DO-IT events, complete individual and group projects, and receive valuable information and support for the transition to college. Program information, frequently asked questions, and details about the application process. Available in PDF. Current and back issues of the Scholar yearbook. Celebrate the impressive accomplishments of DO-IT Scholars and Ambassadors! Love the program? Please consider donating to ensure the success of the program.